I sure hope that this works out. Callie, our panda cory, the only remaining surviver of the odd illness that took the other pandas about a year and a half ago, has been alone for several months. She has no barbels, so we are hesitant about adding any more cories in with her (worried about them catching whatever is going on, and/or Callie being out-competed for food). So, we have the mystery fish who came in with the loaches and cories recently for the 20g. Loaches will move to the new 55g, and the mystery fish, which we think is a guppy, will move into Callie's tank, not a cory - but maybe some company!. Edit: we have acclimatized the guppy (that's the final verdict for now, a female guppy!) and she is in with Callie...all is good so far...hubby had to go to work, so I will be up late watching them until he gets home! I hope this works our...! ...and now I am panicking, thinking we made the wrong decision....sigh....I think there is too much flow in Callie's tank for this little fella...and I am now worrying that she may get stressed and bring illness into Callie's tank! Double sigh....oh my gosh...I just may worry too much! Don't worry; the flow will be good for this fish. It doesn't have any impediment whatsoever in terms of body shape to be able to handle flow. I second Biulu! As long as the little one looks like it's in good shape, should be good to go. Thanks Biulu and CAA! They are doing well together so far. I notice that the guppy watches Callie when she plays in the bubbles, almost looks curious. Callie, however, doesn't seem to pay any attention to the guppy. Very glad to hear. Probably seeing another fish, especially if the new guppy is relaxed, may help increase to activity level. I'm sure it makes her feel more safe. CanadaquariaAdmin wrote: Very glad to hear. Probably seeing another fish, especially if the new guppy is relaxed, may help increase to activity level. I'm sure it makes her feel more safe. Well, Cherry Berry is definitely not aggressive (although, even if she were, I think Callie could take her out due to the massive size difference! ). I wouldn't call Cherry Berry relaxed though as she is extremely active - I don't think I have ever seen her 'stop moving'! This was the main reason I was concerned about the filter outflow - I'm half wondering if she is unable to sit still because of the current. My endler/guppies are quite hyper. I think it's normal for non-fancy guppies. They don't have big flowing fins to slow them down! @Orlon11 wrote: My endler/guppies are quite hyper. I think it's normal for non-fancy guppies. They don't have big flowing fins to slow them down! Our feeders definitely don't have the big flowing fins (very colourful and beautiful - but not fancy by any means!). 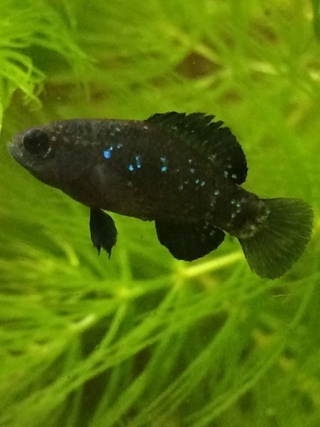 At this point, Cherry Berry does not have flowing fins - but she is still so young, and she is practically see through at the moment (heck - still not even positive she is a she, or even a guppy! But the probability is high that we are looking at a guppy at least!). I will keep monitoring and hope that this combination turns into a friendship for Callie Bear and Cherry Berry! My first reaction was to laugh - I, however, am not sure if this is cute behavior, or something I should be concerned about! Cherry Berry is now not only following Callie, but also digging in the sand with her. 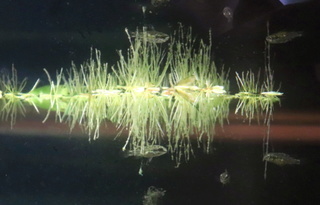 I have never seen my feeder guppies do this before! I am not joking, Cherry Berry simply follows Callie and digs behind her now. This sound normal? @Shell wrote: This sound normal? So, reality shows scream fake to me! Maybe this is not normal behaviour then? I really have no where else to put her, we only have two male guppies, that would not be a good fit for her at this point. She is too small to put anywhere else. I am confused, is she mimicking Callie? Is this just typical baby guppy behaviour? Digging can't hurt her, can it? 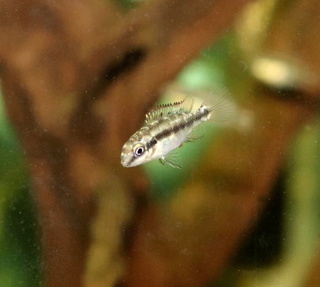 I have one dwarf loach that schools with my rummynose tetra, back and fourth, back and fourth. I think a bit of mimickry might not be unusual, especially in a tank where there are just them. 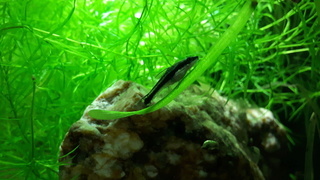 @CAAIndie wrote: I have one dwarf loach that schools with my rummynose tetra, back and fourth, back and fourth. I think a bit of mimickry might not be unusual, especially in a tank where there are just them. I am leaning towards this 'school of thought' as well - phew, I may not need to get Cherry Berry into therapy after all!